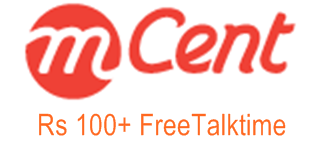 and visit here Offer page to Download list of mcent app and get talktime of Rs. 100.
to Login to your account by mobile or PC browser/ make a new one if you don’t have one by CLICK HERE for sign up & use opera in mobile. Now Download Mcent App To Recharge Your Amount to Your Mobile No. Next Day you’ll get more offer of more then 30 Rs. Note:- First Signup using Mobile browser, and Visit this page to download application and Download Mcent App At last to recharge mobile otherwise you’ll not get daily offer.